This is part two of a 10-part series chronicling the R&D of a wave energy converter. Read part one. It had been four years since I first learned about renewable ocean power technology. I now had a team, funding, and the beginnings of a plan to build a wave energy converter (WEC) using off-the-shelf parts so that others could take our plans and improve them. Even before the project ever started, I had countless designs all worked out in my head. Yet, as painful as it was at the time, my initial vision would eventually have to be shaped and refined into a working physical prototype grounded in solid engineering fundamentals and teamwork. Over the duration of the project, the WEC design would go through three drastic design iterations before reaching the fourth and final design, WEC_004. Our grant sponsor, CITRIS, had given us one year to implement our proposal and spend the funds accordingly. However, as senior engineering students at UC Davis we all had to participate in a senior design project before graduating. After speaking with the class professor, we decided to roll the grant funding into our senior design project with the understanding that this would accelerate the project timeline. This meant we would be able to focus all of our time and attention on one large project rather than dividing our time between a senior design project and the renewable energy grant project. The timeline was set in stone, and we had to finish the project in order to graduate. We would spend the first 12 weeks of the class researching and designing, and the second half of the class we would build the WEC in the student shop and test it in the ocean. The countdown began. The first two weeks of the project we worked together daily. Even when there was no official team meeting scheduled, we would inevitably run into other teammates in class and the conversation would always drift back to the WEC project. It was unavoidable. We knew we wanted to build a WEC and were hoping we might be able to test it in Bodega Bay, so the next step was figuring out how to convert the motion of the ocean waves into electricity. Two years earlier I found an in-depth research paper titled “A Review of Wave Energy Converter Technology” while researching wave energy for a class presentation. Since we had less that 12 weeks to design the WEC, it was understood that we weren’t going to develop some new, novel way to harness energy from waves. Instead we planned to incorporate existing technology into a more accessible platform that others might be able to replicate. The manuscript was a great place to start, and I highly recommend it to anyone interested in wave energy, as it’s packed with jargon and terminology related to ocean power. Within the first week the team agreed to focus on designing a point-absorbing linear drive system that would bob up and down in the waves to produce electricity. Since we wanted our design to be readily adopted by others, we felt the device had to be able to operate in a wide range of wave conditions. Point absorbers are able to collect energy from waves regardless of where the waves are coming from. This makes them particularity suitable for locations like Bodega Bay, where the waves predominately approach from the northwest but can suddenly switch and approach from the south during large storms. 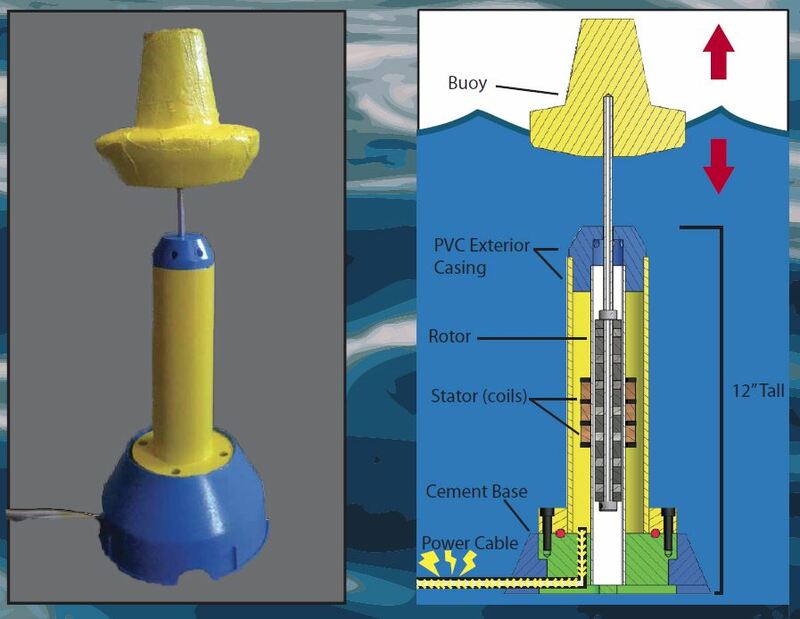 By making the floating buoy circular in shape, the WEC could receive waves from any angle. Being that a linear drive system only has 1° of freedom, our design would be concerned with harnessing the heaving, up-and-down motion of the waves. This linear drive design made the mathematical modeling more manageable and would also be much easier to fabricate in the student shop. Early design of power take-off system that fit inside the WEC_001. Now that we had decided to use a point-absorbing linear drive system we then needed to select a power take-off system that would physically convert the heaving motion from the buoy into electrical energy. We could’ve used magnets and wire coils to directly convert the up and down motion of the waves into electricity. A few years earlier I had used this idea to build a wave energy converter model using neodymium magnets and coils of magnet wire. It’s the same principle used in the rechargeable flashlights that you shake: as the magnet moves in and out of the coil, an alternating electric current is induced in the coils. As long as the magnet is moving you can create electricity; however, the voltage and frequency of the electricity fluctuate based on the speed and displacement of the magnet, which makes collecting the energy more complicated. The team’s WEC project was going to be much larger than my tiny PVC pipe model, and since none of us were electrical engineers the thought of building a circuit to rectify and condition the signal terrified all of us. Even without phase and rectification issues, the price of rare earth magnets was skyrocketing, which made the idea financially impractical. Mini WEC model built in 2010 using magnets and coils. Next we considered using pulleys and counterweights encased in a watertight housing: a network of pulleys, ropes, and weights all moving together, anchored to the ocean floor and tied to a floating buoy bobbing at the surface. Team member Alex Beckerman was especially fond of this idea, because in his engineering mind you can model anything in life as a system of masses, springs, and dampers and then use calculus to find the solution. However, with all the pulleys and bearings needed to make this work, we estimated that frictional losses would greatly decrease the overall power output and that the likelihood of a cable wearing down and breaking was too great. Hydraulic circuit for the power take-off (PTO) system for WEC_001 – WEC_003. Looking for a more simple design with fewer moving parts, I suggested that we use hydraulic components. 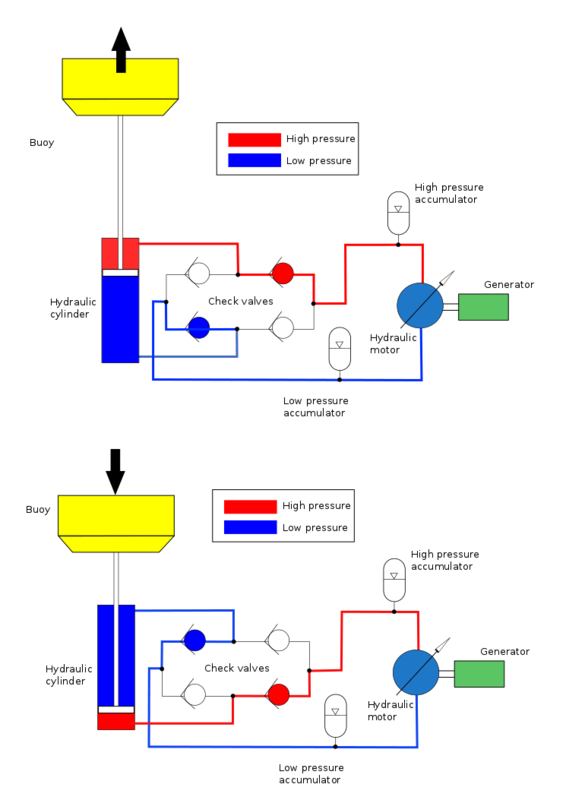 Several research papers online referenced a basic hydraulic circuit that used a double-acting piston to pump fluid through a series of one-way valves and spin a hydraulic motor coupled to a generator. The parts were easy to find, and most of the fittings and components where rated for high operating pressures and could withstand the massive forces and corrosive ocean environment. There were even articles describing how to model these types of hydraulic circuits in a computer simulation to predict the potential power output as a way to evaluate the effectiveness of the system. The only issue is that no one on the team had much experience working with industrial hydraulic components. Sure, some of us had experience fixing plumbing around the house or installing irrigation values, but designing a system with high-pressure accumulators and hydraulic motors, while factoring in pressure losses due to orifice restrictions, was foreign territory. Weighing all of our our options, the team determined that the seemingly relative simplicity of the hydraulics system and the ease of finding off-the-shelf parts made this the winning choice. By the end of the second week we were feeling pretty good. 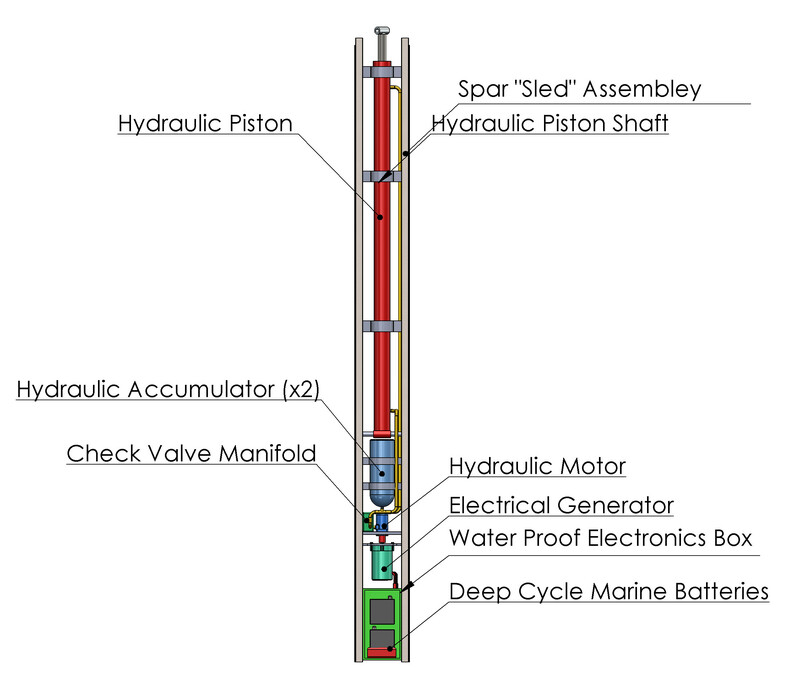 We had made big decisions about the general layout of the design and now that we had agreed to use hydraulics to build our power take-off system, the team could split up and each of us could start working on the various subsections: hydraulics, electronics, buoy, heave plate, and spar. What we didn’t realize at the time was how each subsystem was interconnected to ALL the other subsystems. In textbook problems, most of the variables are either given to you in the problem statement or you can look them up in a table somewhere. So when we sat down to start working on the calculations required to “solve” the WEC design problem, we found ourselves getting stuck in a massive design loop unable to make any significant decisions because there where too many unknowns. For example, team member Tom Rumble would try to determine how large of a hydraulic motor to purchase, but he needed Kevin Quach to select the hydraulic ram first, but Kevin needed to determine the bore of the hydraulic cylinder, which was directly related to the amount of pressure in the system, which led back to the question of the hydraulic motor. Alex was trying to design the large metal heave plate, which would provide hydrodynamic drag that would resist the upward pulling motion from the buoy, but first I needed to determine the total size of the buoy. But before I could calculate the total buoyant force required for the buoy, I needed to know the total weight of the WEC from Teresa Yeh and the weight of the heave plate from Alex. This continued for four miserable weeks and the team slid into a unproductive rut. Heaving motion of the WEC-004 design in ocean waves. By week six I was having trouble sleeping at night. I would lie awake in bed gazing at the ceiling, trying to untangle the entire project like a ball of string all knotted together. The magnitude of the project was weighing on me, and I could tell the other team members were feeling the pressure pile on. Midterms were upon us, which meant project deadlines went out the window. Team meetings became tense, as one person would try to explain that they could solve their portion of the problem if only someone else would give them the information they needed. By now we had moved on to the WEC_002 design with a neutrally buoyant spar made from a 20″-diameter HDPE pipe and prefabricated roller assembly on top of the buoy, but the PTO had made little progress. To add the frustrations, I was trying to figure out how we would actually test this thing once we built it, but my emails to the marine lab were going unanswered and we really didn’t have a backup plan. Something had to change, and fast. Had we been doomed from the start, was this too big and too ambitious of a project for the five of us to tackle? I was beginning to have my doubts. Tune in next week for part 3!